ZIMMERMAN — Five turnovers proved too much to overcome for Delano Thursday night in the season-opener at Zimmerman. Three second-half giveaways especially hurt the Tigers, as the host Thunder turned all three into touchdowns. Zimmerman went on to win the game 37-19. The outcome was significant, as Delano and Zimmerman are Section 6-4A foes. A year ago in Delano, the Thunder defeated the Tigers 28-24 in the opening game. That was Delano’s only loss of the regular season. Zimmerman went undefeated in eight games. Both teams lost in the section semifinals. 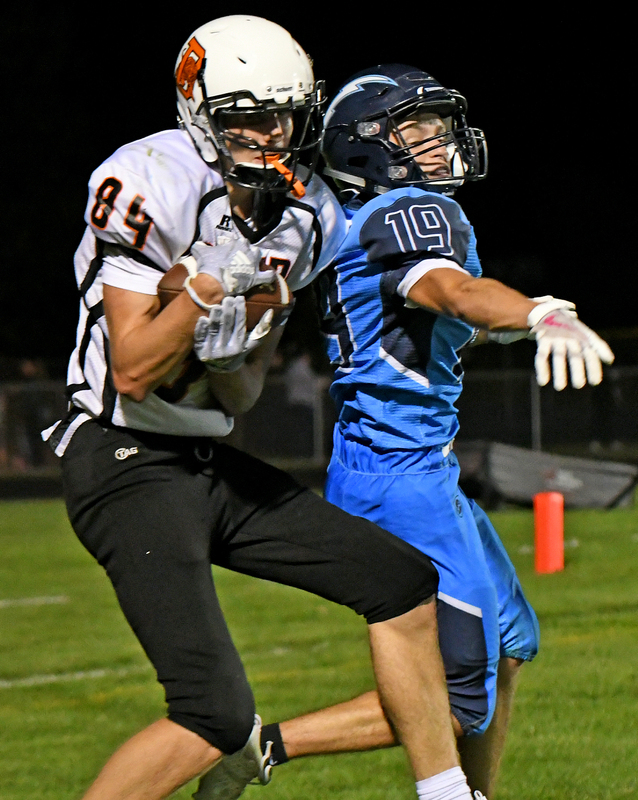 In Thursday night’s meeting, Delano’s second-half woes began on the half’s opening kickoff, when return man Brent Unrein could not corral the football, fumbling it at his own 7-yard line, where Zimmerman’s Brent Netland made the recovery. On the first play from scrimmage, Brett Howard made the turnover hurt with a seven-yard touchdown run. Carter McEachern, Zimmerman’s quarterback, ran the ball in for the two-point conversion. That gave the Thunder a 16-13 lead. Delano secured the ball on the ensuing drive and ran nine plays to regain the lead. Delano’s Trey Longstreet secures the football for a touchdown catch over Zimmerman’s Kyle Briggs in the third quarter of Thursday’s game at Zimmerman. Longstreet caught two touchdown passes, but it wasn’t enough, as five turnovers cost the Tigers in a 37-19 loss. For the second time in the game, Max Otto connected with Trey Longstreet for the touchdown strike, this time from 11 yards out. The touchdown gave the Tigers a 19-16 lead. The conversion failed, and the deficit stood at three points with 8:57 to play in the third quarter. After forcing a Zimmerman punt, Delano’s offense drove the ball into Thunder territory, but the threat ended inside the red zone, where McEachern intercepted Otto’s third-and-long pass. After catching Otto’s pass, McEachern moved under center on the offensive side of the ball, and led a seven-play touchdown drive that would put the Thunder ahead for good. The big play was a 56-yard run by Tim Vorobyev. Longstreet temporarily saved a touchdown with a shoestring tackle of Vorobyev at the 10-yard line. Four plays later, on the first play of the fourth quarter, McEachern finished the drive with a one-yard plunge. Vorobyev’s kick gave Zimmerman a 23-19 lead. Delano’s responding drive went backwards and the Tigers had to punt from their own end zone. Zimmerman return man Wyatt Petron returned the ball to the Delano 6-yard line, where the play began, and three plays later the Thunder was back in the end zone for a touchdown. McEachern ran the ball in from six yards out. Vorobyev kicked the extra point to make it 30-19. Zimmerman’s Tre Wilkins intercepted Otto near midfield with less than two minutes to play in the game. On the Thunder’s first play of the ensuing drive, Landon Berroa went 55 yards on a touchdown run. Vorbyev put the finishing touches on the scoreboard with the extra point. That long run accounted for Beroa’s 95 yards for the game. He carried the ball seven times. The Thunder finished with 260 yards and five touchdowns on the ground, and 318 yards of total offense. McEachern completed six passes for 58 yards. He also ran for two touchdowns and intercepted a pass. Delano’s offense totaled 349 yards. Otto completed 18-of-30 passes for 227 yards and two touchdowns. He threw two interceptions. Longstreet caught eight passes for 76 yards and two touchdowns. Sam Kern led Delano’s ground game with 96 yards on 14 carries. In the first half, the first three combined possessions of the game (two by Zimmerman and one by Delano) were three-and-outs. Delano was the first to get something going, when it took its second possession 13 plays to the end zone. Caden Link’s three-yard touchdown run gave the Tigers the lead. George Horobin’s extra point made it 7-0. After Kyle Briggs’ long kick return set up the Thunder at their own 46-yard line, the offense marched the final 54 yards on 11 plays, bridging the opening two quarters. With 10:34 to play in the second quarter, Howard put six points on the Zimmerman side of the scoreboard with an 11-yard run. The Thunder were looking to tie the game with an extra point try, but, instead, turned a bad snap into a two-point conversion thanks to the athleticism of McEachern. The holder, McEachern, became the runner when he picked up the loose football and finished the play in the end zone. Delano’s next possession ended with its first turnover of the game, this one also coming inside the red zone. Netland jumped on the football at his own 16-yard line. That turnover proved contagious, as it was the first of four consecutive possessions to end in a turnover. Poll’s recovery deep in Zimmerman territory led to Delano’s second touchdown of the game, and the final score of the first half. On the second play of the drive that began at the 12-yard line, Otto found Longstreet for their first touchdown hookup of the game. The 10-yard touchdown pass (the extra-point kick was blocked) gave the Tigers a 13-8 lead at halftime. Delano hopes to rid itself of the turnover bug this week in practice in preparation for the home-opener. The Tigers host Little Falls (0-1) Friday night at Tiger Stadium. Little Falls lost 48-18 to Dassel-Cokato in Week 1. Zimmerman stays home to host Foley (0-1).